Caldwell Toyota-Scion has 23 thermostats to control the flow of heat and air conditioning. Jay Caldwell, right, adjusts one as his father, Jack, looks on. Jack Caldwell's unlikely path to pioneering his environmentally sound Arkansas dealership began with a call from Toyota. Caldwell and his son, Jay, were planning to build a much larger Toyota store than the one they had. The automaker suggested they make it a "green" building. "Green was not really a thing in 2007," said Caldwell, 65. "But they tweaked our interest." Now the Caldwells are glad they got the call from Toyota -- and just as glad they did the legwork needed to bring the idea to fruition. Building a green dealership came to feel right -- and saved them money. The 32,000-square-foot showroom they built in 2008 was nearly three times the size of the dealership they were leasing nearby. The new dealership includes an air-conditioned shop and outdoor lighting, which the previous store lacked, and a much bigger car wash -- all of which are energy hogs. But Caldwell Toyota-Scion's monthly energy costs are only double those of the family's former store -- and less than two-thirds of what they would have been without the new efficiencies. The Caldwells estimate the energy and water innovations added 5 to 7 percent to the design and construction cost of the new dealership in Conway, a town of 60,000 about 25 miles outside Little Rock. They project it will take 6 1/2 years for the energy and water efficiencies to offset the higher initial cost of the building, which they plan to own for at least 20 years. "We were surprised at how little it added to our initial costs," Jay Caldwell said. • A 15-foot-high cylinder-shaped steel cistern that irrigates the property using runoff water from the main building. Jack Caldwell had been in the auto business since he was 16, working for his father's service department at a Ford store in Hope, Ark., where Bill Clinton grew up. The elder Caldwell says his father helped him develop a customer-friendly approach that he has used over the years at Ford, General Motors, Chrysler, Nissan and Toyota stores in which he invested. He no longer owns any other stores. Jack Caldwell never had thought about applying conservation principles to his dealership or considered how they might fit in with the service culture of his business. So at an age when many people think about retiring, Jack Caldwell and Jay, now 37, decided to learn about green dealerships firsthand. They visited one of the first U.S. dealerships to get certification from the nonprofit U.S. Green Building Council: Pat Lobb Toyota in McKinney, Texas. In 2006, Pat Lobb Toyota built a dealership designed to increase natural light and conserve energy. It also recaptured rainwater and air conditioning condensation for use in irrigation and used waste oil to heat the service shop. 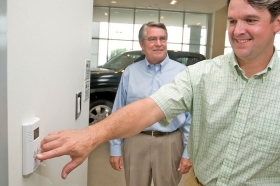 These innovations saved the Lobb dealership $17,000 a month. The Caldwells were so intrigued by what they saw that they returned to Texas several times with an Arkansas architect and contractor in tow. "Jay and I finally said to each other, 'If there's any way we can afford to do this, we have to,' " Jack Caldwell said. The automaker organized a planning meeting that included an architect, a Rice University professor and lighting, heating and air conditioning specialists. When the Caldwells couldn't get tile trim, they contacted Toyota, which got it to them in two days. Toyota also gave the dealership a palette of colors to choose from for recycled tiles. The automaker's greening of the Caldwells' dealership is part of a companywide policy. Whenever a dealer considers building or renovating a store, Toyota talks with the dealer about the benefits of getting Leadership in Energy and Environmental Design certification from the Green Building Council, said Terry Sell, a Toyota national market planning manager. "It's the right thing to do for the community," he said. The Caldwell dealership was the third Toyota store to gain LEED recognition, Sell said, adding that Toyota now has nine LEED dealerships. Nineteen U.S. dealerships now have the certification, a U.S. Green Building Council spokeswoman said. Toyota hopes 10 percent of its dealerships earn this certification by 2015, said Dennis Thornhill, a Toyota retail market development manager. "Going through the LEED process puts the whole package together," Jack Caldwell said. "It makes you disciplined to squeeze every bit of energy savings out of the building." The energy savings "give us a competitive advantage," Jay Caldwell said. "We get savings and customer recognition that we're doing something above and beyond what's expected of a dealership." He added: "The green facility has become part of who we are."